Add the garlic, spring onion, ginger and lemongrass, along with the chilli flakes. Stir to avoid burning and after 1/2 to 1 minute, add the light soy sauce and stir. Add the cabbage, mushrooms and mange tout and cook for a couple of minutes on a high heat while stirring to avoid burning. Once the vegetables are cooked but still crunchy, remove them from the wok and set aside. If needed, re-coat the wok with some 1 cal cooking oil spray and when hot and smoking, add the chicken and stir. Once it has started browning, add the apple and pomegranate. Stir on a high heat for about a minute, then add about half of the dark soy sauce. Return the previous ingredients (all the vegetables) to the wok. 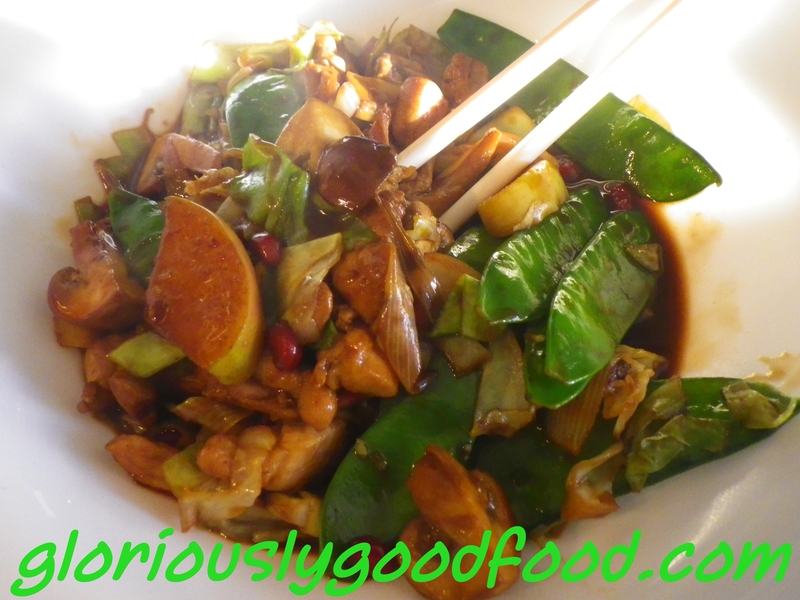 Mix the cornflour with the remaining dark soy sauce and add it to the chicken stir-fry. Stir for a further 30 seconds or so to allow the sauce to thicken slightly. Serve immediately, either on its own or with noodles or rice.